Class starts at 3pm so it’s going to be a late night with puff pastry, soup and a tart to get through. I need to incorporate 750 grams of butter into a kilo of flour for the puff pastry. There are ten vegies to prepare for the pistou soup plus the pistou itself to make and croutons. And the sweet tart has a very short pastry (which means as little handling as possible) and a filling of almond cream, batter and prunes soaked in armagnac. I messed up the puff pastry in Basic and despite my good intentions and best efforts, I do the same here and Chef Paul needs to rescue me. A quick explanation for those of you who haven’t attempted this before. You make a dough and after it’s rested you roll it out into a large rectangle and sit a 750 gram slab of butter on 2/3rds of it. It’s then all about folding and rolling, folding and rolling. My butter’s too hard or too thick or both and the dough’s gone soft. Chef expertly cajoles the pastry into shape but we’re not sure it’s going to be enough. With little enthusiasm I suggest I start again but Chef says let it rest a while and we’ll see. I try not to let it throw me as I start on the soup but I need that pastry over the next few days for sweet pastries and vol-au-vent cases. On with the gorgeous pistou soup – seasonal vegetables, some cooked in stock, others blanched and added at the last minute along with the pistou itself, which is like pesto minus the pinenuts. You have to cook the vegies in stages to get maximum colour, flavour and nutrients starting with sweating the root vegies to bring out the sugars, and then simmering them in stock. It’s 10 o’clock before my filled tart goes into the oven. It seemed to take ages to blind bake and then it had to cool before I could add the fillings. 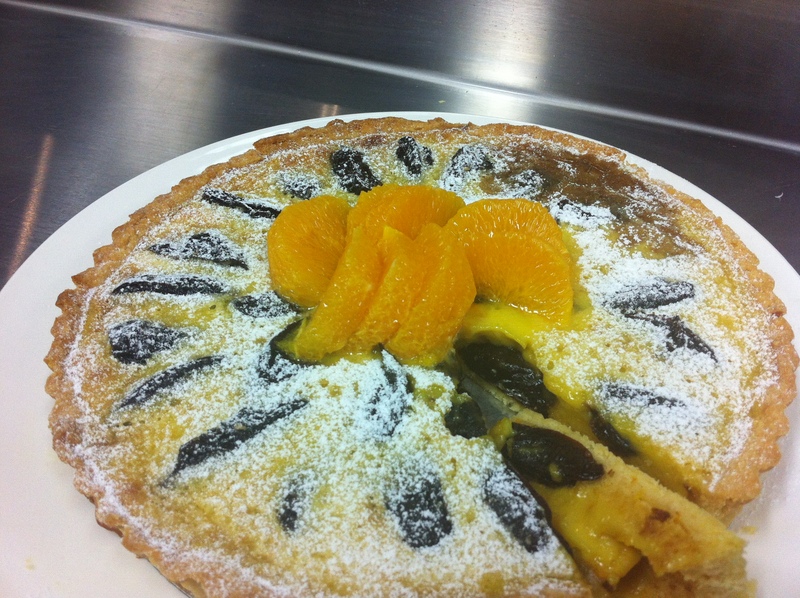 I know I’m going to be the last to present my tart to Chef. But the soup’s ready. 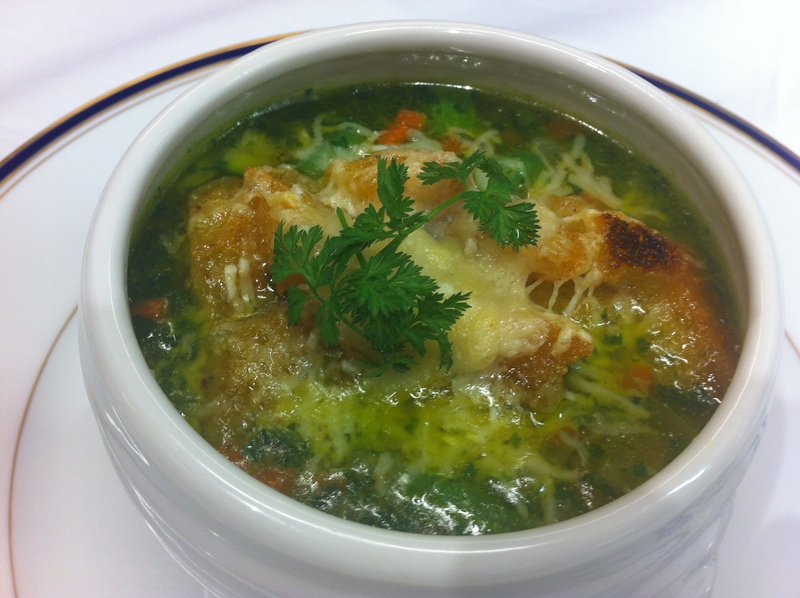 To my taste buds it’s seasoned well, the vegetables are perfectly cooked, the croutons are crisp and garlicky and the parmesan has browned on top. To Chef’s taste buds it needs a bit of oomph. In fear of overcooking the vegies, I haven’t simmered it enough to reduce and enhance the stock. It’s still pretty good though. And the tart is good too. While it’s cooking I have time to fillet orange segments for the top. It’s been a hard class. I’m hot and tired. My face is the colour of beetroot. My hair is sticking to my head. It’s after 11 before I get home for a shower, a nice cup of tea and a lie down. As for the puff pastry ….